While many tourists flock to America’s panhandle looking for sand and sunshine, Florida’s retail development market is doing the opposite: moving indoors. According to JLL research launched today at the International Council of Shopping Centers Florida Conference in Orlando, nearly half of all retail commercial construction happening in the state, in the first half of 2014 is taking place in malls and shopping centers. “While most markets are seeing a boom in grocery-anchored power centers or strip centers, Florida has a distinct need for traditional retail assets that’s driven by the tourist shopper base, which prefers a one-stop shop for their goods along with a climate controlled experience” — John Schupp, Senior Vice President of Retail Development at JLL. Florida’s construction numbers stand in stark contrast to the rest of the country, where the retail development pipeline remains slim, with just 45 million square feet nationwide under construction. However, Florida benefits from expanding retailers and increasing investment allocations. More than 29 percent of all new retail deliveries in the United States in the second quarter of 2014 occurred in Florida, and its major cities are absorbing the space well. Tampa, which has historically been a strong U.S. tourist destination, is seeing the most robust growth with 1.43 million square feet of space under construction as of Q2 2014. Miami, which is a strong international city and one of the tightest Florida markets, has 1.42 million square feet under construction, the greatest amount of development in proportion to its existing inventory. These two locales are leading examples of resilient markets that have the fundamentals and key drivers to support additional supply. 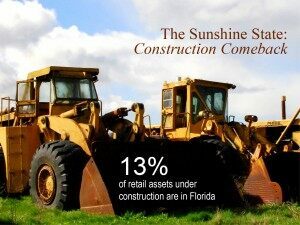 The Florida retail market shows no sign of slowing, despite its loss of momentum during the recession. Development in the state accounts for nearly 13 percent of retail assets under construction nationwide, and a tidal wave of space is expected to come to fruition during the next 9 to 12 months in South Florida. Liquidity in the financial markets has continued to rise to pre-recession levels, increasing the ability to develop new retail assets, or redevelop older properties. “Local, regional and national banks are the most viable sources available for development financing in core markets like Florida, that are in need of new supply. While not as common, we are also seeing life companies open their ledgers for construction-to-permanent financing, especially for strong grocery-anchored assets. Beyond the debt markets, there is a significant amount of institutional equity seeking the opportunity to invest in new and/or stabilized core retail product.” — Jimmy Board, Executive Vice President of JLL’s Capital Markets. Categories: Americas Retail, Development, Malls, Retail Capital Markets and tagged Development, florida, icsc.